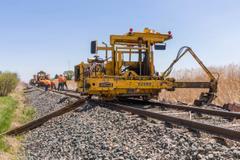 Kansas City Southern Railroad is doing maintenance work on the track along HWY 78 in Sachse. Maintenence vehicles on the tracks will affect traffic light timing along HWY 78, espicially for cross traffic. Light cycles may take considerably longer than usual as the work convoy moves along the tracks.